- Available in Right Handed and Left Handed. - Set-in neck, Scale length is 25.5", 22 Frets. - Body is Mahogany, Neck is Mahogany, Fretboard is Blackwood Tek. These kits are of great quality. There are a lot of inferior versions out there. Your satisfaction is guaranteed with a 30 day money-back return policy. These are great fun to put together and customize. The end result is a one off guitar with your personal touch. 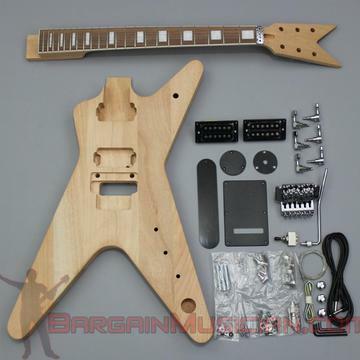 All hardware, and electronics are included in the kit (truss-rod, frets, and nut are already installed on the neck). What is NOT included is stain, paint, or finishing material such as sandpaper. - Finish Sanding and painting of wood. Research how to stain/paint wood for detailed instructions. - Finish sanding/filing plastic covers. - All parts bolt/screw together except the electronics need to be soldered (set-necks need to be glued). - After guitar is assembled you will have to know how (or have someone) to "set-up" the guitar. I.E. Action, truss-rod, intonation.